The Legend of Zelda: Symphony of the Goddesses is coming to Insomnia60, with the event organisers revealing that it will provide a chance to hear music from The Legend of Zelda: Breath of the Wild performed live for the first time in the United Kingdom. The concert tour, produced by Jason Michael Paul Entertainment, has become a regular highlight in the gaming calendar after it was kicked off back in 2011 as part of The Legend of Zelda 25th anniversary celebrations. 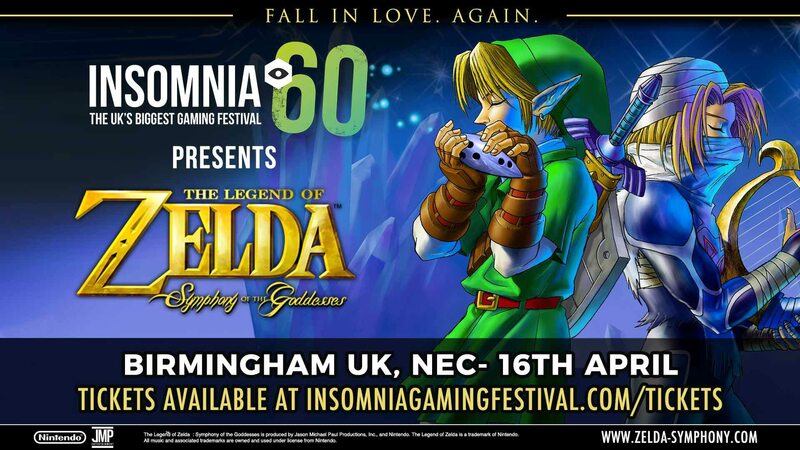 Insomnia60 will run between Friday 14th – Monday 17th April 2017 at The NEC in Birmingham, with The Legend of Zelda: Symphony of the Goddesses concert to take place in the evening on Sunday 16th April 2017. Those that are interested in purchasing tickets should head on over to the official Insomnia60 website. Tickets are priced at Platinum (£67.96), Gold (£47.05) and Silver (£31.37) tiers.